Play On: Green Bay Packers -13. I cannot recommend a Premium Play for my paying clients on a double digit favorite in the NFL, especially off a 5-0 day and a GOY cashing out, but I do sense that if was ever warranted this would be the game, and so it is Green Bay or nothing in this game. The Total is at 55 and climbing on Monday, which is a very high total, and there are game time snow flurries expected, and around 30 degrees at kickoff which is another advantage for Green Bay in this game versus a southern dome team, like the Packers need any more advantages than they already have in this matchup. One of the keys to beating Green Bay is shutting down all world QB Rodgers, but with Atlanta ranked dead last in the NFL at rushing the passer, I do not see how Mr. State Farm Insurance at QB is slowed and may in fact have 4 or 5 TD passes, which should surprise no one. The Green Bay Packers are number 1 in the NFL in scoring points per game, and number 8 in total offensive yards and they are red hot. Atlanta’s strength is passing the ball with QB Ryan and some better than average WR’s and they are ranked number 5 in the NFL, and Green Bay is ranked number 11 at stopping the pass so the going will be tough for the dirty birds. No running game for Atlanta as the rank number 27 in running it at under 95 yards a game on the ground, where do the points come from? Also bear in mind Atlanta is not a good road team at 2-4 ATS and Green Bay is UNDEFEATED against the Las Vegas Line at home. Cannot make a case for Atlanta even with the huge points, who despite having a 5-7 record and still in the playoff hunt with New Orleans losing yesterday. They are outmanned here and quite frankly will also get out coached. If Aaron Rodgers is on your fantasy team, you are smiling tonight! 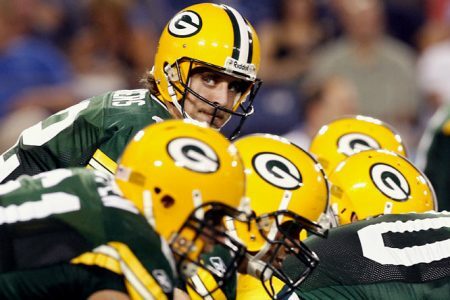 FREE Pro Pick – Green Bay Packers.